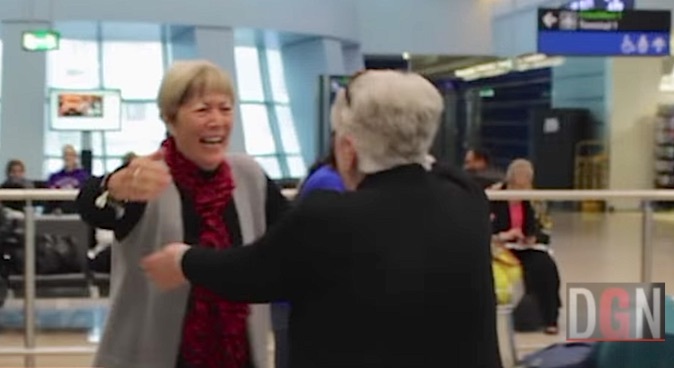 A Northern Irish woman only discovered in 1989, that she had an older sister—and finally embraced her for the first time at the arrivals gate of Dublin airport on Tuesday. 27 years ago, Lesley Fagan’s mother told her she had a sister, who had been placed up for adoption, but searches since then have been futile. She recently learned that other twins had been reunited through Facebook, so, Fagan posted an online appeal that eventually led to her sister. The Dublin Gazette was at the airport to record the moment when she met Joan Crawford-Murray, who traveled from her home in Perth, Australia.